Danville Automation Holdings, LLC (“DAH”) specializes in materials handling, automation equipment, conveyor systems, and packaging and puck handling. DAH consisted of 3 operating units: Simplimatic Automation, Inc., Multi-Flex Systems, Inc., and Advantage Puck Technologies, Inc., which provide material handling and automation solutions. 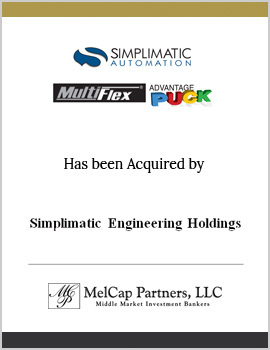 MelCap Partners acted as sell-side advisors to Danville Partners. Danville Partners sold DAH to Simplimatic Engineering Holdings, a private equity and management firm.